As 2011 winds to a close, it’s time to start penciling in important dates on the 2012 calendar. 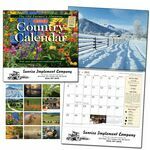 Logo’d Gear offers a wide variety of calendars to fit every need. For keeping a logo and contact information someplace that’s easy to find, nothing beats a magnet calendar. Simple rectangles come in a variety of sizes and proportions, in landscape or portrait orientation or standby square. Stock shapes include houses and vans. Organizations looking for custom shapes can call and talk to an experienced professional. For added value, some magnet calendars include notepads, mini memo boards, and sticky notes. Peel-n-stick calendars are economical and offer the recipient the choice of location, and are available in shapes including barn, van, car, house, animal, and heart. Keyring calendars will never be far from a customer’s hand. Wall calendars come in full-year or monthly styles, are available in sizes from the economical mini 5×7 to the poster-sized 22×29. Monthly calendars come stapled or spiral-bound. Photo themes are offered to fit every organization. Automotive calendars include muscle cars, antiques, and hot rods. Americana from illustrated art to agriculture, scenic to American agriculture. Animals, such as puppies and kittens or wildlife, are perennially popular. Golf, swimsuit, homes and gardens are sure to please. Thought-provoking motivational, inspirational, and religious themes promote positivity. Mouth watering monthly recipes bring branding into the kitchen. Businesses can cater even more to their clients’ needs with calendars featuring custom illustrations. A phone call to Logo’d Gear can get the ball rolling on these welcome gifts. Desk pad calendars are a must-have for workers in many fields. A mousepaper calendar combines style and function, and offers a fresh surface every month. Tent desk calendars really stand out. Farmer’s Almanac calendars are traditional favorites and come in a multitude of styles to fit every need. Striking style sets Red Moma Magnetic Perpetual Calendars apart. Photo calendar frames draw the eye, and come in traditional or digital. Cube, acrylic, and click ball styles enhance any desktop. Their lasting value makes them great gifts or rewards for dedicated employees or loyal clients. Digital perpetual calendars can include dynamic tools such as a calculator or world clock. Of course, all of these quality calendars come with branding, and many have space for an address, phone number, business hours, and other information customers need right at hand. Logo’d Gear can help every business start the New Year right.